Hay House Inc., 9781401947446, 288pp. You want change. Maybe your career isn’t what you thought it would be . . . or your relationships aren’t what you had hoped. Perhaps you have a grand vision for your life but not the smallest clue on the steps to get there. Whether you’ve read the entire self-help section of the bookstore in vain or feel completely stuck on where to begin, you wish you had someone to hold your hand and guide you.You do. 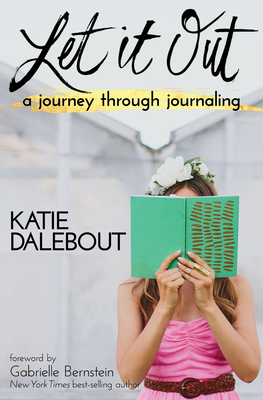 And it’s only a blank page away.In Let It Out, millennial blogger, speaker, and podcast host Katie Dalebout shares the transformative practice that will rocket your life to the next level—journaling. Discovering in her darkest hours that a journal is the greatest tool in finding your purpose, healing yourself, and creating the life you most desire, Katie has assembled the remarkable tools and insights that will elevate your life and get you "unstuck"—for good.And don’t worry—you don’t need to be a writer! Journaling is simply a method of coaching yourself through your "stuff" and letting it out on the page, unclogging your mind from years of destructive thoughts. In doing so, you step into a position of unsurpassed clarity.Packed with journaling exercises, prompts, and techniques that can be done anywhere and in any order, this interactive guidebook offers you a new way to navigate your daily life, cope with stress, and create exciting, permanent change. Divided into seven sections covering everything from clearing clutter to finding presence to cultivating abundance to moving beyond fear, this book will be your new best friend and coach anytime you seek clarity or crave solace.Simply grab a pen, open your journal, and prepare to let it out. Through her writing, podcasts, videos, and courses, millennial blogger, speaker, and podcast host Katie Dalebout curates inspired wisdom that guides people to go deep and sift through the thoughts clouding their minds. She’s a regular contributor to Refinery29 and MindBodyGreen, and her work has been featured in Teen Vogue, Yahoo! Health, and The Daily Mail. In 2013 Katie launched the weekly interview podcast WWRadio, which attracted wellness and lifestyle celebrities such as Gabrielle Bernstein, Tara Stiles, and Joe Cross in its first few episodes. Katie helps people develop a positive image of their bodies through embracing their creativity and personality outside of their physicality, and she’s on a mission to share journaling tools that invoke deeper authenticity and true self-acceptance. If you’d like more inspiration from Katie, visit her in Wellness Wonderland at www.katiedalebout.com or follow her on Instagram, Facebook, Twitter, and YouTube: @katiedalebout.